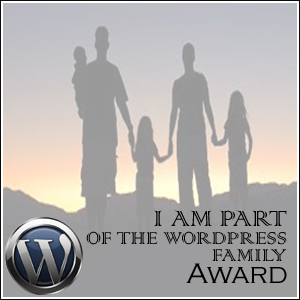 I have been nominated for the WordPress Family Award by one of my favorite bloggers (Iam who Iam). In order to officially accept the award, I’m required to nominate ten other bloggers for the same award. To accept the nomination, if you want, you have to follow the rules explained in this link. I always drop in when I get a ping back.. Welcome to the Word Press family lol..
thank you. I’m not sure what I have to do now if I have to post the image from your site and this is it? I am good at explaining this. Just look at my page, make it look like that..But the 10 people you pick are your friends..
Do you know how to get the Award picture up? I can help…let me know.. I was just showing the link to where I created it, but I seen you did that already. Just copy how I did it and how your friend did it..Easy Award.. Just pick 10 people and show the Award Picture so they can send it to 10 people.. Yes, of course. I already sent the picture to my ten nominees I hope i did it all right. Did you blog it like I did and your friend did? If so, that is correct. In-fact..is that the blow above? lol…Sorry, if so, I am an idiot, sorry..Yeah that is fine..
you’re not an idiot Just is the first time I have a nomination for an award in this blog experience that’s it. My first one!